In 2015, Scandiweb successfully performed a migration of their online store from ZenCart to Magento eCommerce platform, including completed redesign of the existing website. When we started to work with the client, they were already using Amazon US and CA, including FBA services. There were 259 items (67 in FBA) in Amazon US, and 14 items (12 in FBA) in Amazon CA. All products, prices, reports were managed manually by one of the sales persons. Amazon Fulfillment service was used not only for Amazon orders, but also for phone and online store order processing. Sales from Amazon were not available within Salesforce (which was used as Order Management platform), so we summed up all sales reports, monthly fees, referral fees and used for further analysis. 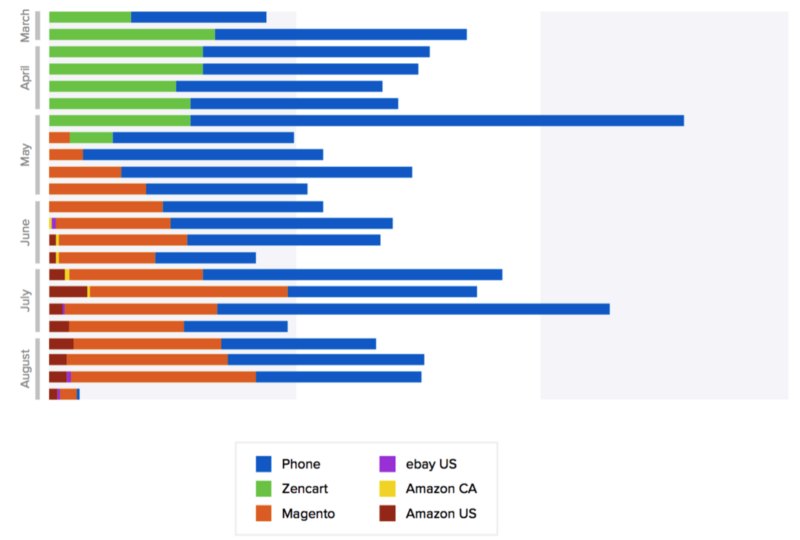 Overall, the situation with Amazon US/CA was pretty good, on avg. 100+ orders per month. And almost all bestsellers were fulfilled automatically via FBA, so did not require attention from salespeople. Seller ratings were also very high — 94% positive. Opening an eBay store requires minimum effort, so it was one of the first things we did in order to expand company sales channels. avoid currency conversion from USD to CAD after order is paid. As you may know, eBay allows anyone to sell any goods, so it is an open market for C2C and B2C. But in order to have an eBay Store, you should sell at least one item using standard account and get a positive feedback. And as any new account, you have a limit of 10 selling items. After filling in Shipping, Payment and Return policies, and linking PayPal account separately for eBay US and CA we were ready to sell. 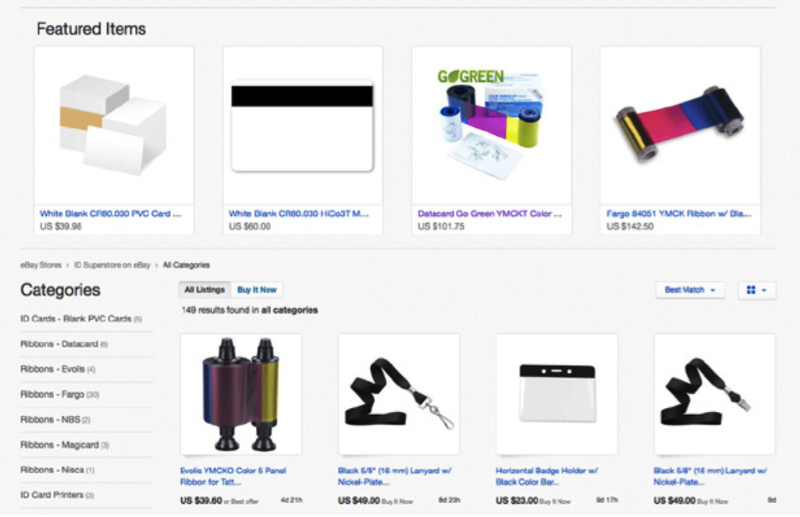 Several top selling products were added manually with minimum margin in order to get first orders come in. In order to advertise client’s brand, appropriate landscape banner and logo were uploaded on the eBay user page. User collections were used to replicate product categories. After several weeks the first order was received on eBay US, and we were able to start an eBay Store, which gives seller an opportunity to publish many products for fixed monthly fee, and pay lower referral fees upon sale. What else? Advanced category tree, featured products, advanced selling dashboard for admin and opportunity to customize your store template. We have noticed that demand on eBay is much lower compared to Amazon, and partially because of low prices offered by other sellers, especially from China, and lower minimum order quantity. Therefore, we decided not to invest too much time into eBay Store enhancement, and use it as an advertisement of online store. So we had to import many products, and make it easy to manage it. Nowadays it is popular to use PIM to store all product data and push it to all of your sales channels. Unfortunately, there was no such system for this client, and it requires a lot of time and effort to get it ready. For us it was crucial to manage product data of all four accounts (Amazon US/CA, eBay US/CA) within one system, otherwise it would take too much time to follow up, manage and update using spreadsheets. As a result, we decided to go with M2E Pro module for Magento. Each marketplace is represented as separate entity within M2E Pro, and it is really quick and easy to setup per account. Before linking live accounts, sandbox accounts on development server were tested. There are many configuration and synchronization options, so we made sure everything will work as we expect it. First, we started with product export to eBay US, since it was fresh and easy to manage. 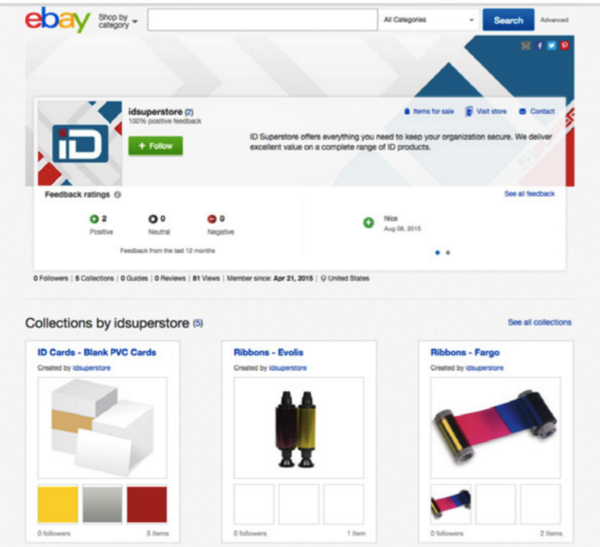 Separate listings per product type per eBay account were created, and appropriate pricing strategy was applied. Preparational work was required as well — double check product title length to be less than 80 characters and product images to be bigger than 500px in width. Since we wanted to get more attention from eBay users, in most cases no or very low price margins was applied compared to online store prices, and mainly low cost items were represented (below $200). manually imported items had custom SKU values, and in some cases were not the same as in Magento. Step by step we were solving these issues or skipping some items to get as much bene t as we can in short time. On parallel we had to pay attention to supplier MAP policies, which required additional listings with custom price policy configuration. After 3 months we were selling 149 items on eBay US, 6 items on eBay CA (got no order, even at very low product prices), 553 items on Amazon US (44 in FBA) and 31 item on Amazon CA (2 in FBA). FBA users may have issues with aged items. And if you want to avoid additional fees from Amazon, one of the quick options how to sell such items on Amazon is promotions functionality that allows to provide discounts on selected items. But it has to be managed within Amazon dashboard. Detailed reports of sales orders play important role in eCommerce, and every business owner wants statistics from all sales channels to be available at his fingertips. There was no doubt we needed to export orders from Amazon and eBay to Salesforce, and thanks to M2E Pro module we were able to import orders from Amazon/eBay to Magento, and Magento itself had order export to Salesforce. Sounds like no big deal, right? Well, partially it is true. We tried to keep everything as simple as possible, and asked developers to enhance existing order synchronization with sales channel information for sales reports, and new shipping and payment methods provided by marketplaces. The only big problems faced during order synchronization was mismatch of package information per sales channel, and custom SKUs that did not exist in the online store. The first was fixed manually on daily basis, until all products in Magento were updated to packages. And second required new SKUs to be created in Magento as hidden product. One thing we did not do is order status update, so salesperson has to update orders when they are shipped within eBay/Amazon and insert tracking number. In general, it is possible, but requires many development hours to cover all possible business cases, so this time it was not worth the investment. However, within Salesforce sales order information we provided order number and link to order in marketplace dashboard, so it is faster to process. Amazon and eBay marketplaces connected to Salesforce via Magento was the main result of the completed work. Now it is easy to add and manage products and prices among sales channels, and process orders and analyse results within one OM/CRM platform. Adding more products to Amazon resulted in order qty increase from 100+ to 120+ per month. Benefit of using FBA is huge — 80% of all orders are automatically fulfilled, and customers are ready to pay 5–10% higher price compared to competitors. eBay marketplace is more difficult to maintain — it requires to analyse competitor prices and product titles/types with more attention. With 1–2 orders per months it becomes self-sustainable, so we can cover monthly fees. Also we have noticed that many customers suggest their own prices that is lower than sales price, but higher than the cost, so definitely enable Best Offer option, and analyse if selling for lower price is still profitable. Unfortunately, we did not receive any orders in eBay Canada. Even when product price was decreased 30%, number of views per item did not increase. On parallel Amazon Canada generates 2–5 orders per months. It shows how sales channel depends on sales market. When both marketplaces are set up and easy to manage, reports are your key to success. Analyse trending products, play with prices, drill down your clients and try to convert them to online store customers. In addition we can say that Amazon provides great and detailed reports that can be very useful for sales analysis, but still Online Store may provide much more information about your potential and returning customers.